Tiny Trees is a competitive tree building board game where the trees you grow branch into the third dimension! 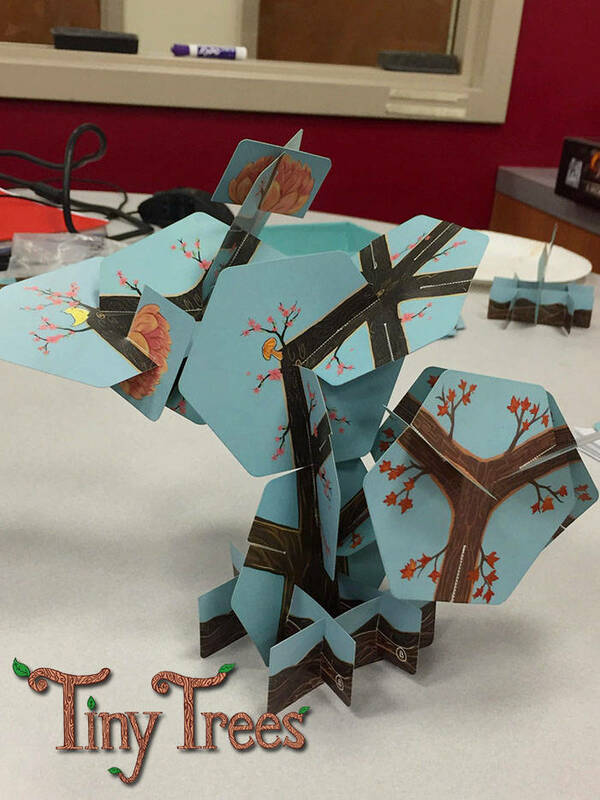 Unlike most board games that lie flat on your table, the trees you grow branch out into the third dimension! Whether you want to relax and creatively grow a tree or focus on the deep-rooted strategy to win, you'll be creating something you can be proud of from the moment you open the box. 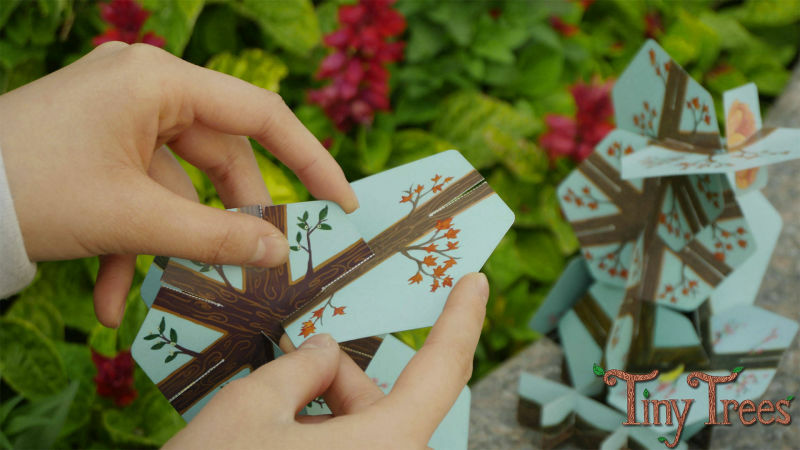 By slotting together hexagonal cards, you can grow trees out of your table! 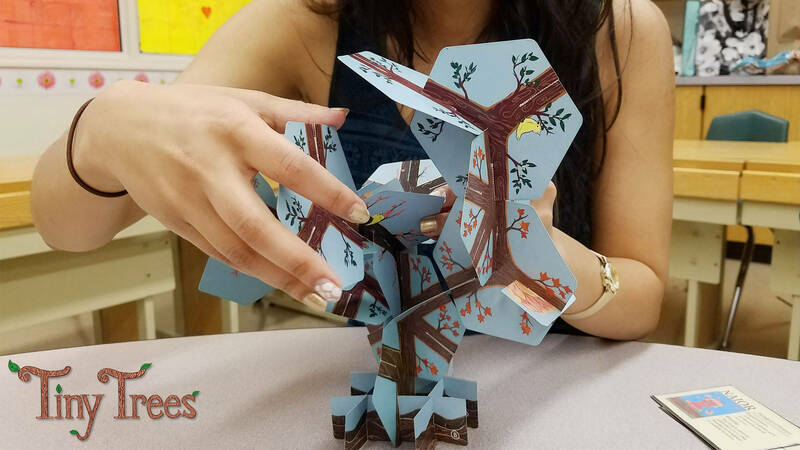 The hexagonal shape makes the overall structure look extremely natural and allows the player to grow whatever they want. Blessings alter the rules of the game or allow spirits to take different actions under the right circumstances. With 28 unique combinations, the game is further altered every time and makes the strategy more interesting! 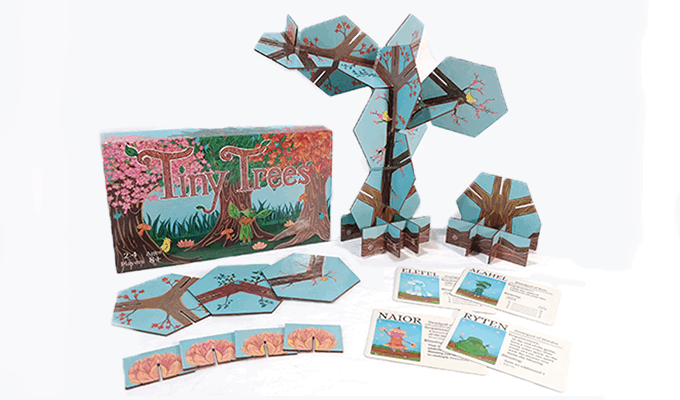 Even though Tiny Trees is a competitive game, we didn't want to create an environment where players sabotaged or ruined other people's trees so the game doesn't pit players against each other! However, if you still want that type of experience, some of the blessings allow you to interfere with other players’ progress! 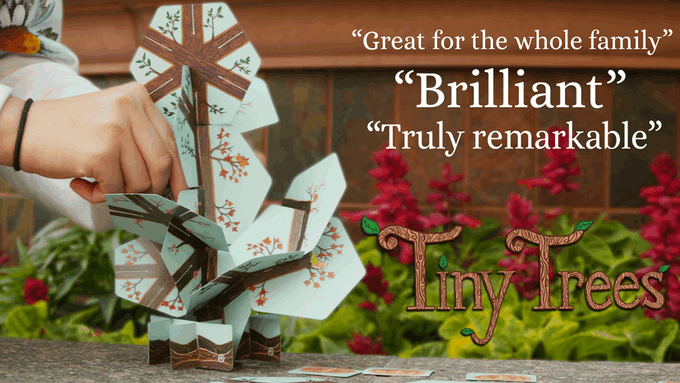 Since you earn points at the end of the game, you can tailor what you earn points for if you want to focus more on the strategy or if you just want to sit back and enjoy curating your miniature tree — Tiny Trees supports it all! This also means that the game is well suited for all ages since you can still be proud of what you grew throughout the game whether you win or lose! Click here to download our images and video as a zip! Click here to download our logos as a zip! 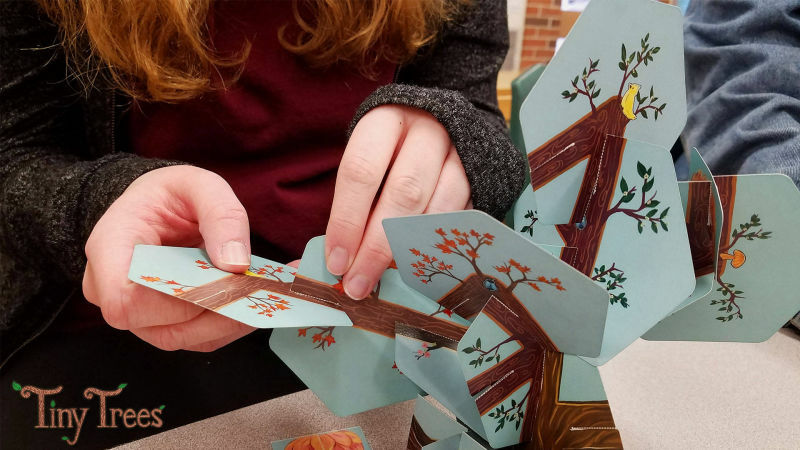 This game started in September of 2017 as a solo class project of Michael's in a board game design class and was initially designed to make the players feel stressed. 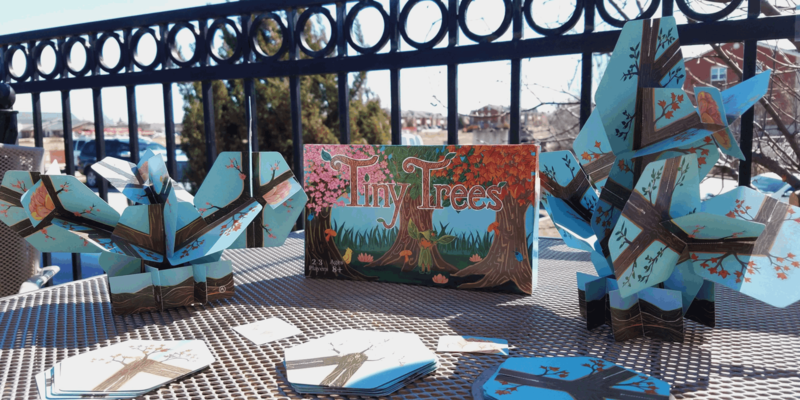 Originally inspired by bored Dungeons and Dragons players stacking dice, the tension they felt when they got to the last dice spawned a game where players had to stack Jenga blocks to grow “trees” of a certain height. 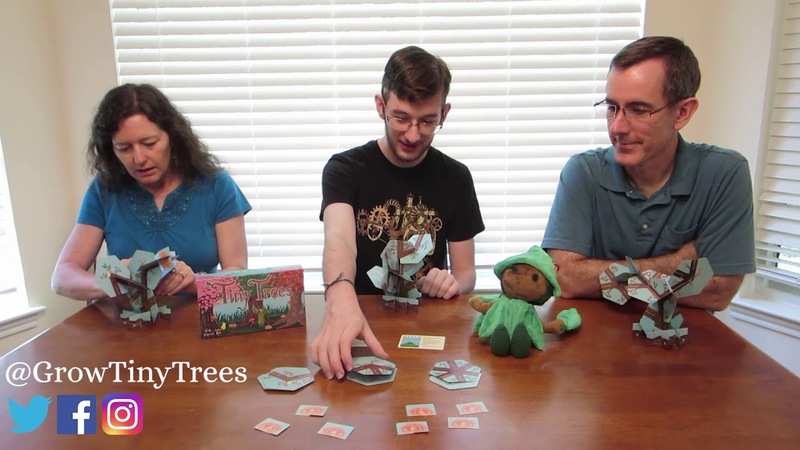 Players enjoyed the creativity and personalization they could have while growing their trees and Michael wanted to maintain that feeling when it came to the next iteration of the game, which is when Joanna joined the team. The team couldn’t find readily producible wooden blocks so the game underwent many changes. Michael still wanted the game to be about nature and took inspiration from growing bonsai trees. The solution then was to use hexagonal cards and slot them together to still preserve the creativity and personalization in the original. When making prototypes, Michael cut out over 200 of these hexagons and continued to iterate and improve on our prototypes. The game has been playtested over seventy times with hundreds of people, and the design team has spent many a long night pouring over the feedback and data obtained to continue improving and iterating on the gameplay. Michael is the lead designer on Tiny Trees. He is an eighteen year-old freshman at the USC School for Interactive Media and Game Design. He loves to both play and design games and have been doing both for the vast majority of his life. He's heavily inspired by the steampunk genre, but is primarily inspired by nature. Joanna Yu is a co-designer and lead artist on Tiny Trees. She is an eighteen-year-old student studying Interactive Media and Game Design at USC. She loves painting landscapes, drawing birds, and petting dogs. Her favorite video games include the Final Fantasy, Tales of, and Fire Emblem franchises as well as Overwatch. Send us an email at GrowTinyTrees@gmail.com to request a review copy of Tiny Trees! You will be asked to provide credentials. Images can be downloaded as a .zip here.